Trees on the cliff cage clouds, half moist. The brushwood gate beside a steam is newly opened. ‘The Asian Collections: Art Gallery of New South Wales’. pg.148. Signed and dated u.l. corner., in Chinese, inscribed in black ink "...on the day of the Duanyang (fifth of the fifth month), in the year of Wuchen (1628) painted and inscribed by Wang Jianzhang". Signed u.l. corner., in Chinese stamped in red ink, "Yu Laixuan [artist's seals]”. Signed u.l. corner., in Chinese stamped in red ink, “Wang Jianzhang [artist's seals]". 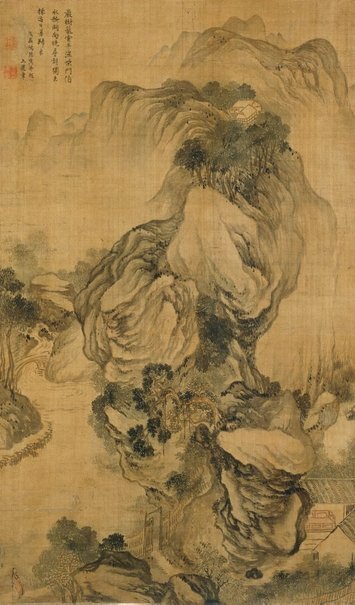 Yin Cao, The Connoisseur and the Philanthropist: 30 years of the Sternberg Collection , 'Chinese Art', pg. 12-23, Sydney, 31 Jan 2014, 21 (colour illus.). Edmund Capon, The Connoisseur and the Philanthropist: 30 years of the Sternberg Collection , 'The connoisseur and the philanthropist: the creation of a collection', pg. 5-10, Sydney, 31 Jan 2014, 5 (colour illus.). The colour illus. on page 5 is a detail of this work. Edmund Capon, The Connoisseur and the Philanthropist: 30 years of the Sternberg Collection , 'The connoisseur and the philanthropist: the creation of a collection', pg. 5-10, Sydney, 31 Jan 2014, 6. Bruce James, Art Gallery of New South Wales handbook , 'Asian Collection: East Asia', pg. 246-287, Sydney, 1999, 254 (colour illus.). Jackie Menzies, AGNSW Collections , 'Asian Art - India, South-East Asia, China, Tibet, Korea, Japan', pg. 173-228, Sydney, 1994, 200 (colour illus.). Goldie Sternberg, Look , 'The Priest of Ink', pg. 14, Heidelberg, Dec 1993-Jan 1994, 14 (illus.). The Asian Collections Art Gallery of New South Wales , 'Landscape Painting', Sydney, 2003, 148-149 (colour illus.). The colour illus. on page 149 is a detail of this work. Art of the Brush - Chinese & Japanese painting calligraphy , Sydney, 1995, 9 (illus. ), 10.